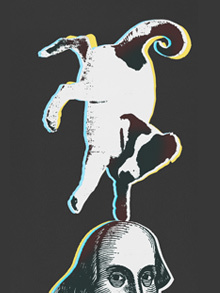 The programme for Dmitry Krymov’s production, a special commission for the World Shakespeare Festival, depicts an acrobatic Jack Russell Terrier balancing on one paw on top of Shakespeare’s head. It is an image that says everything and nothing about the production that “turns Shakespeare on his head”, speaking to the conscious irreverence of the company’s approach. The play’s double title was itself an act of misdirection, the “As You Like It” perhaps more appropriately glossed as “if you like”. Apart from the promise of Venya — the aforementioned performing dog — this was a production that revelled in its surprises and secrets. 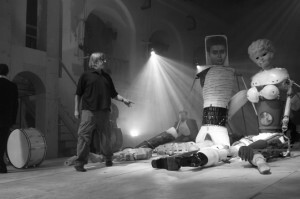 This collaborative Russian-language piece, bringing together the Chekhov Festival and director Krymov’s experimental laboratory based at the Moscow School of Dramatic Art, took as its theme the final act of A Midsummer Night’s Dream. The Royal Shakespeare Theatre was covered in plastic sheeting and sawdust, into which unfinished space an enormous company of clowns, technicians and actors struggled to drag spectacular pieces of scenery. Sprawling branches, an enormous tree trunk and a gushing fountain appeared and were taken offstage, never to appear again. As they bickered, a captioned ‘translation’ informed us that the Mechanicals were debating the thematic and linguistic complexities of Pyramus and Thisbe, establishing straightaway an idea of comically distrustful mediation. The self-awareness of the production was its own theme, a deconstructed process of establishing and immediately challenging its own identity. In sequence, a long train of finely dressed audience members were escorted onto the stage and to boxes and balconies on either side (at its peak, about fifty performers shared the stage). These nobles turned up their noses distastefully at the ramshackle arrangements. Standing for the wedding guests of Shakespeare’s play, the rude guests proceeded to answer their mobile phones, interject with personal anecdotes (causing the production to halt at awkward moments) and criticise the arrangements loudly, providing an ongoing framework for the play that turned interpretation itself into a performance, the spectators increasingly involved in the spectacle. Meanwhile the Mechanicals donned tuxedos and one apologised for the ramshackle nature of the performance, though pointed out that there was no way for the audience to know whether or not this was deliberate or a matter of exigency. This was the game that the paying audience was asked to play along with the on-stage spectators; was this seemingly random assemblage of images, physical comedy, puppetry, music and apparent improvisation as random as it appeared? Was this show incomplete, or was its incompleteness, in fact, the point? The main action, inasfar as the main action could be separated from the other layers of performance, concerned two ten-foot high puppets of Pyramus and Thisbe, manipulated by the company and made up of scraps, with grasping metal fingers. A narrator informed the audience that the company had decided on Pyramus and Thisbe as a story of pure love, and their meeting and wooing was played out at length. Male and female operatic singers “voiced” the puppets as they moved clumsily around the stage. “Pyramus”, with a cut-out image of a youthful boy for a head, gathered a bouquet from various bunches of flowers held up by clowns in various extraordinary poses – one standing on another’s shoulders, one balancing on his head on top of another’s head and holding the bouquet with his foot, one wobbling on top of a stack of four precariously balanced cylinders. The combination of humour as the Mechanicals attempted to maintain control of their puppets and wonder at the physical dexterity of the clowns served to heighten the meeting of the lovers, turning a simple romance into something more transcendent. At first this was undercut with deliberate crudity. The puppets sat together as Venya performed for them, and Pyramus fed assorted fruits to Thisbe whose head unhinged, as if a dustbin lid, to swallow the food whole. The onstage audience finally erupted in disapproval as Pyramus’s crotch panel was unscrewed to reveal an enormous phallic balloon that the Mechanicals pumped up. However, as the lovers parted following the outrage of the spectators, the production’s tone shifted. Thisbe was attacked by a lion, a costumed actor with enormous dragon’s wings, who was dragged back by other performers. Venya barked in defence of Thisbe, and an actor tore off strips of her skirts and scattered them on the floor, interspersed with strips of red. As she left the stage, the lights fell, the singers sang and a moon rose behind the back curtain, through which Pyramus slowly emerged. In an extraordinarily moving sequence, Pyramus discovered the bloodied strips and the puppet exploded, arms and torso being carried to different corners of the stage and coming back together three times. Each time, Pyramus’s face had changed, becoming increasingly aged and bearded. Finally, he thrust a sword into his stomach and the puppet was left in a pile for Thisbe to discover, flanked by four puppet swans who lamented alongside her. The pathos was, once again, undercut by the Mechanicals, who performed a ridiculous noise collage of shrieks and shrill singing, before being joined by four ballet dancers who performed the cygnets’ famous steps from Swan Lake while the rest of the company broke up and began chatting and laughing with their onstage audience. An old Mechanical began sweeping the stage with a broom instantly recognisable as Puck’s, forcing the dancers to skip about. As she departed, one of the onstage audience members had a simple moment of reunion with her Puck, suggesting they reunite for another show. The play stumbled to a close in this combination of beautiful images juxtaposed with the mundane, seeking the universal story buried under the momentary spectacle. Capturing the spirit of Dream, this collage of stunning visual images, extraordinary physical performances, evocative music and a dancing dog ultimately exposed the art of storytelling itself. Its studied artlessness belied the detailed craft on display in a deliberate strategy, designed to best show the production’s heart in an evocation of love and laughter. What do you think about this interpretation of Shakespeare? Have your say in the comments board below! For more reviews of productions in the World Shakespeare Festival, visit Year of Shakespeare. Peter Kirwan is Teaching Associate in Shakespeare at the University of Nottingham. His main research is on plays of disputed Shakespearean authorship, and he has published on early book history and contemporary performance of early modern plays. He reviews theatre on his website The Bardathon (http://blogs.warwick.ac.uk/pkirwan) and is currently preparing an edited collection on Shakespeare and the Digital. He is a Trustee of the British Shakespeare Association. Follow Peter on Twitter at @DrPeteKirwan. I thought this was a wonderfully interesting and charming production and nothing like what I had expected (which is, in itself, a challenge when performing Shakespeare). The pathos and humour were as carefully balanced as the one brother doing a head-stand on the other’s head. It offered an interesting perspective on theatre, its audience, the preparation, and treated the script with an irreverence whilst remaining true to the central theme of Pyramus and Thisbie (like Dream) being a great love story. The puppetry and the opera singing worked beautifully together. The image they used for Pyramus reminded me of a funerary portrait of an Egyptian boy called Eutyches and, when put next to Thisbie’s plastic doll head, was, I thought, a reference to the timeless nature of the love story. It was not what I was expecting at all, but I thought it was a joy. It was a slow starter, but the puppetry and the music were absolutely beautiful. I also had to smile at mechanicals operating mechanicals! Great theatre. I found this production to be touching, charming, and enjoyable – A really great piece of theatre! It was wonderful, much better than the other Shakespeare plays showing. Russian is the in thing as we also went to take in Matilda the Musical where Russian is also an essential ingredient. John Lennon was right: Imagine !